House Speaker John Boehner wants big spending cuts in exchange for support to raise the debt ceiling. NEW YORK (CNNMoney) -- House Speaker John Boehner indicated Monday that he plans to hold a hard line in debt-ceiling negotiations. Among his demands: Spending cuts in exchange for support to raise the debt ceiling -- and the cuts will have to be greater in magnitude than the ceiling increase. Boehner reiterated his stance that the spending cuts should be in the "trillions, not just billions" and that simply agreeing to spending and deficit goals for the future won't suffice. "They should be actual cuts and real reforms to these programs, not broad deficit or debt targets that punt the tough questions to the future. 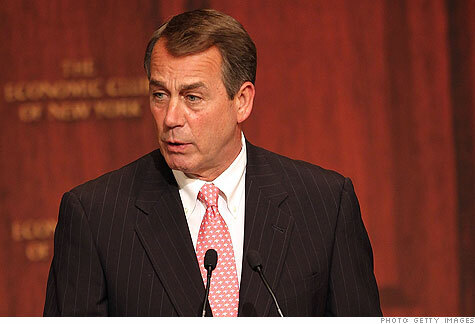 And with the exception of tax hikes -- which in my opinion will destroy jobs -- everything is on the table," Boehner said. It's unclear just how many trillions in spending cuts Boehner is seeking and over what time frame. But he may be laying down a marker of more than $2 trillion, since congressional sources tell CNN they expect the House could vote to increase the debt ceiling by about $2 trillion. Boehner delivered these remarks on the same day that Tea Party activists accused him of being a "surrenderist ... who waves the white flag before the first shot is fired" and, most cuttingly, a "wimpy" "Republican in Name Only." It's not clear whether his hard line will temper Tea Party frustrations or how it will play at the negotiating table. Democrats aren't likely to embrace his opening bid. Boehner's proposal "seems far-fetched," Sen. Daniel Inouye told CNN. Inouye, chairman of the Senate Appropriations Committee, is helping to negotiate a debt ceiling deal in talks led by Vice President Joe Biden. One congressional observer wasn't expecting Boehner's position to be quite so strongly stated. "I find these remarks a little surprising, because they leave less wiggle room than I might have imagined," said Norm Ornstein, a resident fellow at the American Enterprise Institute. He said Boehner might be trying to "convince his freshmen and hard-liners that he has tried to strike the toughest bargain he could -- but it is risky." Bond market experts said they understand why Boehner is talking tough early in the negotiations -- offering "red meat to the masses," as Calvin Sullivan of Morgan Keegan & Co. put it. And Jim Vogel, head of interest rate strategies at FTN Financial, said Boehner's remarks aren't likely to unsettle the markets. Still, the showdown over the debt ceiling could backfire. "Any action that weakens the investment community's confidence in the U.S. government's willingness to stand behind its obligations could have long-lasting, destabilizing effects to investment markets," Sullivan said. The expectation -- and the concern -- is that the negotiations over the debt ceiling will go down to the wire, just as the 2011 budget negotiations did, when a deal was struck 90 minutes before a scheduled government shutdown. Treasury Secretary Tim Geithner has said he expects U.S. borrowing to hit the debt ceiling by May 16, but he estimates he can use "extraordinary measures" to keep the United States out of default until Aug. 2. After that, however, the United States will only be allowed to spend what it takes in from federal revenue. That means, on average, the country will come up short by about $118 billion a month. At that point, Geithner will have to pick and choose which bills to pay. Several conservative lawmakers say the country won't be in default on its obligations as long as it continues to pay the interest owed on U.S. debt. But Geithner believes any failure to meet a legal obligation will be perceived as a default by the markets, with punishing long-term consequences for the U.S. economy. Boehner, who in the past has indicated that the debt ceiling has to be raised no matter what, suggested on Monday that worse things could happen. "It's true that allowing America to default would be irresponsible. But it would be more irresponsible to raise the debt ceiling without simultaneously taking dramatic steps to reduce spending and reform the budget process." --CNN congressional producers Deirdre Walsh and Ted Barrett and senior congressional correspondent Dana Bash contributed to this report.